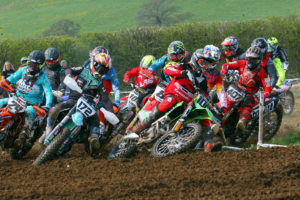 The Grasstrack season steps up another gear this Sunday 14th April with the Ledbury Motorcycle Club hosting their fantastic Ledbury Leader Grasstrack at Sparrington Farm, in Herefordshire. The event also doubles as round 1 of the Western Centre Championships and incorporates The “Frank Yates” Memorial Trophy. A stellar line up has been accumulated across the board with a stacked youth line up too. In the 250’s there is a complete mixture of young upstarts and veteran racers with Luke Harris, Tim Greig, Graham Thomas, Ben Worral and Chad Wirtzfield all going to be there or thereabouts when the final comes round. The 350 class is one of the best seen for a while with Tom Perry a sure-fire favourite, but with a host of wiley campaigners up against him, like Mark Giles, Dave Mears, Wayne Broadhurst and Neil Taylor he will be pushed to the max. In the 500cc solo’s our new Feature racer James Shanes makes his first appearance on the green stuff in 2019, but he will have stiff competition from the likes of local favourite Rob Finlow, Tom Perry, the evergreen Tony Atkin and Speedway convert James Wright. The entry is also packed in the Upright and Pre 75 classes, plus the ever-growing GT140 class. Josh Goodwin and Liam Brown will take some stopping the 500cc Sidecar class, while in the 1000cc Sidecar category the best in the business line up with the Mark Cossar/Carl Blyth outfit being pitched against the top line crews of Tom Cossar/Wayne Rickards, Kieran Hicks/Kieran Ivy, Paul Whitelam/Liam Brown and Matthew Fumarola/Gareth Williams. Practice starts at 10.30am, with the first race at 12.30pm. Camping is free for the weekend, with spectator entry bein £12 for Adults, £10 for Concessions with Under 6’s FREE.